Ok, there’s a bit too much mirth and goodwill in the air after last week’s stroke-fest over the Transfomers-themed birthday party. It’s almost as if they want me to victimize them, people. I can hardly be blamed for the the insensitivity and callousness that follows. Source: Kids and Cakes Etc. Yeah, I’d be making the emoticon face for consternation, too, if someone modeled my head after a football. Or maybe Yoda’s frustrated because you’ve imposed some arbitrary 1970s motif on him with that butterfly collar and the floral print. Damn, why don’t you just stick some corduroy bell-bottoms on the revered Jedi Master and call it a day? When your Yoda has more black lines across his face than Darth Maul and more crags than The Emperor, something has gone awry. I hate to break it to you, “young Connor,” but there’s a strong chance that Mommy doesn’t love you. Otherwise she would have put some effort into this cake, instead of throwing something together after an afternoon on the couch in front of Oprah with a bottle of wine. Oh, where to start. 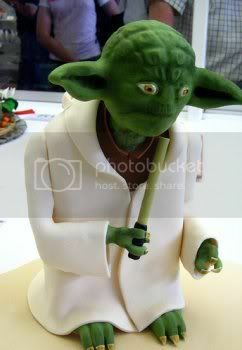 1) Yoda doesn’t actually look like Telly Savalas with a set of big, pointy ears. 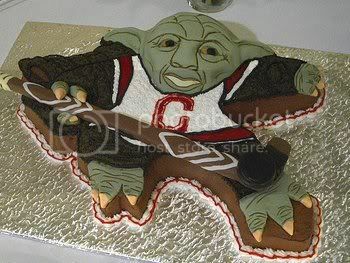 2) Yoda does not play hockey. 3) Yoda definitely didn’t go to your college. Even if your college gave him an honorary degree, Yoda still wouldn’t wear your stupid college’s sweatshirt. 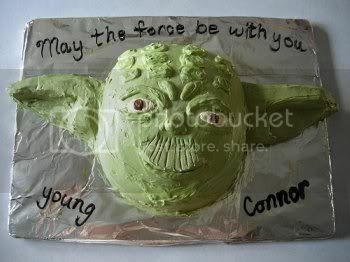 Yoda doesn’t pander like that. You know, I wouldn’t mind getting any of these cakes really (#1 in particular speaks to me). 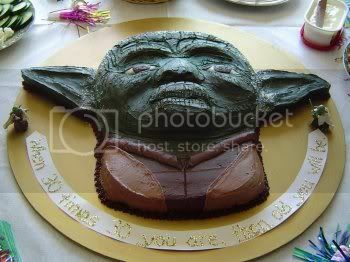 These are all at least ten times better than the Death Star “cakes” you posted a few weeks back. Oh, I see how it is — can’t embed images in comments. Thanks a lot GWS. Stop judging me. Tom Cruise was on Oprah. You would’ve had to get drunk, too. @Nathan D: That Anakin Skywalker bust is truly horrifying. Thanks for sharing. I think the last one might be Yoghurt playing collegiate hockey, which, while still totally weird, is not completely unreasonable. 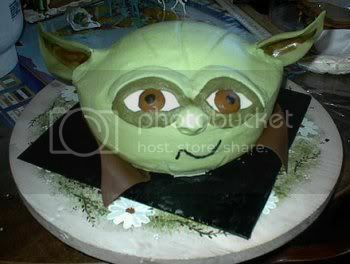 Number 4 looks like a teletubbie Yoda! and 5 is actually not that bad!